I know, I know. You are good and tired of me nudging you about the new kourse at Sketchbook Skool. Message received. But I want to just give you another taste of what has me so worked up about Expressing, how inspired I have been in making it and working with these new artists. And how you — even though you have never taken an art kourse and never will (yes, yes) — will be fired up too if you join us. I won’t say any more I just want you to watch this. Did it melt your frozen heart? Good. Now, click to enroll. Previous Post How to watercolor: In under 3 mins. Good Grief Charlie Brown – Amazing and wonderful way to spend a cold winter dreaming of the garden to come or thankful for the garden last year. This alone is a reason to get the class but I have to wait for my social security check and save up a little in order to take the class. This little book is exactly my kind of fun. If I had won the Power Ball money, I would have a blast giving it away and most certainly be more comfortable but I wouldn’t DO anything more than I am now – creating is so much fun. I’m sure the rest of the classes are just as wonderful, but I have to save up. Glad it is an open ended class. Open ended? Not really. Enrollment closes tomorrow and we may not offer the kourse again for six months…. I’m in already and can’t wait to hear that little tune tomorrow morning. Don’t worry about being too enthusiastic – can’t be helped when you’ve got a good thing going. And you do. It’s snowing here and I just made a new journal and I can’t wait!!! I’m ready to go! LOVE little books with envelopes and twists and turns. I already signed up! This is my first class with the Sketchbook Skool land first online class I have taken. I’m a bit daunted by the technology end of things, but this delightful little book inspired me to take the leap! Sweetest video ever. Lovely book creation. Omigod I so can’t wait for this class!!! A kindred spirit!!! I love growing my own food! We have three apple trees, a peach tree and raspberries, strawberries and blueberries and I have onions out in my garden right now that I am overwintering for the Spring. “They” saw to paint what you see every Day. This just gave me a few ideas! And the funny thing is, I found out that my family name, Weston, were farmers in England/UK. No wonder I have such an affinity for growing things!!! So exciting!!!! Can Jill join us for a sketch outing? This is truly beautiful and detailed ! Didn’t get around to posting yesterday, but this. You must see this. I love to sketch and draw AND I love making my own little books. 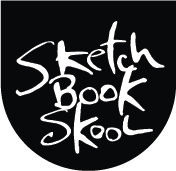 So excited for this newest round of Sketchbook Skool…and to study with Jill. Thanks Danny Gregory and Koosje Koene for working so hard to make this a reality. I am TRYING to enroll, but when I click on the logo to purchase, it sends me to something that says my cart is empty, which sends me back to the logo to click on! A circle that gets me nowhere!! eally looking forward to the new course. There seems to be a lot of lessons in the Expressing course(fantastic). Is that normal? Is that all for $99?? Hallo, just wanted to say that I’ve enrolled for the new Expressing course and I am really looking forward to it – all the ‘tasters’ have been really great – but I must agree with Susan Lysik about the ‘background music’ overwhelming the dialogue. It does make it difficult to follow what is being said, and I’m glad that Susan has mentioned it! Sorry, Val and Susan. We make films not just instructional videos and music is often a part of the atmosphere we are creating. We are sensitive to any spoken parts and believe we mix the music appropriately. But I’m glad you mentioned it nonetheless. Danny, I love the marimba music in Jill’s film. Do you know the title or composer? I “heard” lots of grousing about Jill’s week, but it was one of my favorites! I hope she takes none of it to heart! Thanks of always finding people who make the world beautiful 🙂 (I know this is an old post, but I hope you read it nonetheless!). Actually Danny my comment about the background music to some of the videos being rather loud and making it difficult to hear the dialogue, wasn’t meant to be personal. It just meant to be a constructive criticism!! Okay, okay already! I’m in. I watched this and said, “That’s how you do creative.” Really inspiring, makes me want to go out and draw. Anything. Thanks for sharing! The SEEDS book is so wonderful! It looks like it was very gratifying to make, and it turned out beautiful. I loved the seed catalog on repurposed paper. So creative! Exquisite! Can’t wait for the second Expressing Klass. And this time I DEFO won’t miss out. What a beautiful video — and gardening book! Absolutely love it! !